Attitude Towards Cheating: Why So? Nowadays, a number of dishonest students at colleges is increasing dramatically. Still, the worst part here is that students don’t even feel guilty about cheating. On the contrary, some of them might be proud of themselves. Parents and teachers are responsible for such behaviors in most of the cases. Why? Because plenty of them do not teach children that cheating is bad or simply never mention it at all. Moreover, some parents encourage such an attitude towards studies. Elder students often show a wrong model in front of young students. Due to such situation there is no wonder that attitude towards cheating is positive and no one is feeling ashamed. On the other hand, some children are taught strong moral values (in religious families, for example) and they work hard in order to get good marks. Such students simply know the value of knowledge and they are usually good at arranging their time, because they often need to make a plan for the whole day in order to manage everything. There are great works of Stevens and Stevens (1987), Davis et al. (1992), Love and Simmons (1998) and Straw (2002), which show some of the main reasons on why students cheat. Reason # 1 Genuine lack of understanding. Some of the students cheat without a direct purpose. They just cannot express what they know using scientific words. The only way out is to retell everything with “their own words”. So they actually have the knowledge, but use cheating in order to make their words sound more scientific. Reason # 2 Efficiency gain. 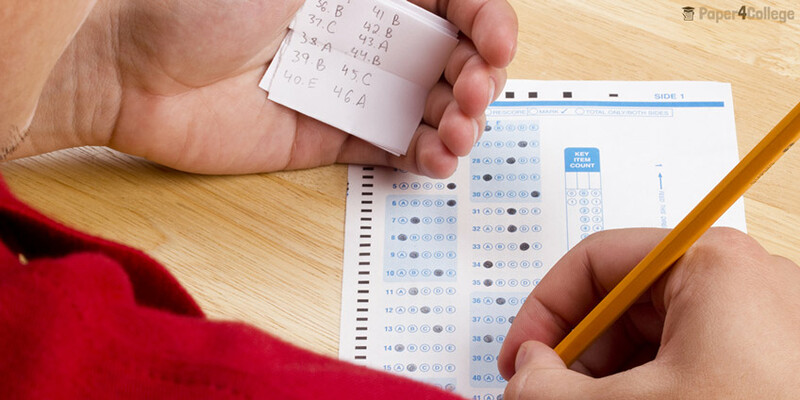 Most of the students cheat to get a better grade during the class or exam. Sometimes, they just want to save their own time and go earlier and cheating sounds like a great decision for them in most of the cases. Reason # 3 Time management. Apart from the studying process, we have lots of other different activities in our lives which we should also prepare for. We have hobbies, we want to spend time with friends, go to movies or simply rest at home. So that is why students tend to cheat, because it is faster than writing by yourself and start completing other day tasks. We should also remember that cheating is not only about class work or exams, it also refers to so-called “copy&paste” phenomenon. Reason # 4 Personal attitude. As it was mentioned before, some of the students don’t feel guilty about cheating or making short cuts and even feel proud of themselves. Sometimes, they do it simply to minimize social pressure, as cunning and witty teenagers usually are in the center of attention. To some individuals, cheating is a way of demonstrating opposition and expressing a lack of respect for authority. Rated 4.5 | 239 votes.